Pump: Triplex Hi-pressure General pump, Belt driven (dual belts), Adjustable unloader valve, Pressure relief valve, thermostat, By-pass water is recycled back to 225 gallon tank. Oil Fired Burner: Beckett 12 volt Burner system, 10 gallon fuel tank, Racor Heavy Duty Fuel Filter. Stainless Steel outer coil wrap, ½” schedule 80 heating coil. 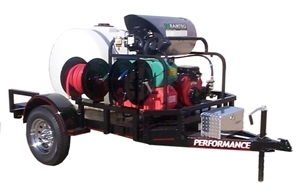 Hose Reel & Hose: High pressure Reel w/100’ 4000 psi rated hose with fitting. Water Tank: 225 Gallon water tank with screen filter, Water hose connection on tank for easy fill. Stainless Steel retaining straps, 8” tank lid. Trailer: 5' x 9', Torsion Bar axle (3500 lb) suspension, DOT lighting w/4 pin flat connector, 2" hitch, Diamond Plate Steel deck, Safety chains, top wind trailer jack, 15" - 6 ply tires.